Not more than a decade ago, one could probably make the argument that the favorite artist award of college a cappella groups could easily be given to Coldplay. The abundance of covers from "Fix You" to "Viva La Vida" were everywhere you looked. But in the last year or two, a new poster child has come along and given us plenty of arranging material for at least another decade. We're hinting at the one and only Sia. From chart-topping dance club jams such as "Titanium" to her earlier works, like the tear-jerking ballad "Breath Me" she is an artist that completely covers the spectrum with her music. One of her latest songs is currently making its way through the aca-scene, "Cheap Thrills." 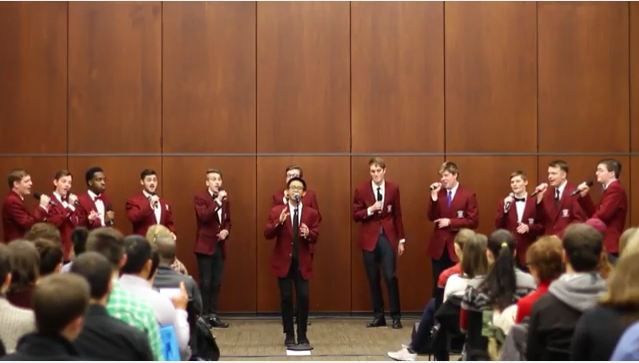 The reggae, synthpop track covered by Loyola University Chicago's Acafellas features some great moments of vocal harmonies, an abundance of bounce in the rhythm, and an overall light tone that's fun to enjoy from beginning to end. This cover is a small sample of what you can expect from the Acafellas this Thursday as they host "Aca Live" via our Facebook page.